In unprecedented event, Israel Police suspect incendiary balloon originating in Gaza landed in Be'er Sheva. Israel Police suspect that for the first time, an incendiary balloon sent into Israel by Gaza terrorists landed within Be'er Sheva - over 40 kilometers (25 miles) away. 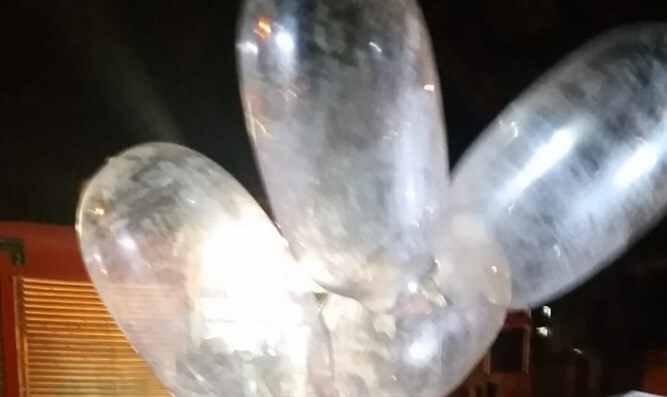 Israel Police sappers arrived on Be'er Sheva's Ringelblum St. following a civilian report that a balloon attached to a suspicious object had landed on the street. The sappers closed off the street, reopening it after the device had been neutralized. Ringelblum St. is just north of the Be'er Sheva's Soroka Hospital. In a statement, Israel Police said, "These are balloons attached to suspicious objects. In most cases, the object is incendiary. In every case, these objects should be treated as suspicious objects which are very dangerous." "In such cases, please call the Israel Police hotline, 100, and distance yourself from the area until police sappers have finished their tasks." Earlier n Monday, incendiary kite and balloons burned a pair of tefillin (phylacteries) and sparked 14 fires in the Gaza border area. Firefighters succeeded in extinguishing all of them almost immediately. Nearly two weeks ago, Hamas promised to end the kite terror.